Can we talk about these pants now? These were another hand-me-down from Katrina before she left and I seriously love them! They are a size too big, but when you cuff them they look more like a boyfriend pant and I really love the relaxed fit! Great addition to my year round wardrobe, no?! You are one beautiful mom! LOVE this look and the color combo is to die for!!! Absolutely LOVE the shoes and stackable rings (I will be watching for these in "shop my..." lol)! Cute outfit. I love your wedges and blazer, I can see why its sold out. The color is stunning, goes with everything. This is a perfect "meet the teacher" look..I love it!! Yay for the little man starting school! After I graduate in May I will be an early childhood teacher here in Milwaukee :-) Maybe one day I'll venture down to the Chicago area! Sniff. Sniff. I thought it was going to be tough to send Moose to EC Sped at CPS, but so far so good. Hope you like it. We love our program so far. 5 days is a lot, but it's so nice to have one kid for a few hour stretch. Cute outfit. I love your blog and that you prove being a mom doesn't mean you have to stop being fashionable! Can we talk about how much I am in love with this mix of pink and olive green? COLOR COMBO PERFECTION! PERFECT relaxed mom on the go..but still chic as ever. Great blazer and especially love it paired the boyfriend cargos!!! Your jacket looks almost identical to the F21 one I bought recently. I love it paired with green cargo style pants. And those wedges do look very comfy. Hope your little guys does great at school. I am sure it will be harder on you than him in the beginning. I am leaving tomorrow for a week long consulting gig and freaking out about leaving my kids! cute shoes and ring! hope the lil guys' 1st day was extraordinary! wow, this cargos actually look gorgeous on you! so not typical! As your child's teacher, I thought it inappropriate that you made me take these photos outside the school. I get paid to teach spelling and reading and stuff. Next time, at least slip me a $20. I am just dying over your blazer. The color is absolute perfection, and it looks awesome with your outfit! I love these colors together! you look stunning! WHY is that blazer sold out?? oh...prob b/c it's AWESOME!! good luck with sending him off to school!! 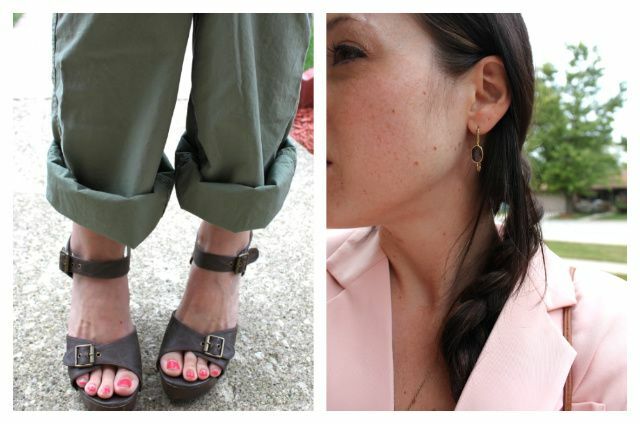 In my opinion green cargo pants are a neutral and you can pair them with avsolutely everything except a camo shirt : ) I also have those Rachael earrings. I love Jewelmint buy my credit card whishes I would cancel my membership.